Histoplasmosis is an infectious disease caused by inhaling the spores of a fungus called Histoplasma capsulatum. Histoplasmosis is not contagious; it cannot be transmitted from an infected person or animal to someone else. H. capsulatum is a dimorphic fungus, which means it has two forms. It is a mold (mycelial phase) in soil at ambient temperatures, and after being inhaled by humans or animals, it produces a yeast phase when spores undergo genetic, biochemical, and physical alterations. Histoplasmosis primarily affects a person's lungs, and its symptoms vary greatly. The vast majority of infected people are asymptomatic (have no apparent ill effects), or they experience symptoms so mild they do not seek medical attention and may not even realize that their illness was histoplasmosis. If symptoms do occur, they will usually start within 3 to 17 days after exposure, with an average of 10 days. Histoplasmosis can appear as a mild, flu-like respiratory illness and has a combination of symptoms, including malaise (a general ill feeling), fever, chest pain, dry or nonproductive cough, headache, loss of appetite, shortness of breath, joint and muscle pains, chills, and hoarseness. Chronic lung disease due to histoplasmosis resembles tuberculosis and can worsen over months or years. Special antifungal medications are needed to arrest the disease. The most severe and rarest form of this disease is disseminated histoplasmosis, which involves spreading of the fungus to other organs outside the lungs. Disseminated histoplasmosis is fatal if untreated, but death can also occur in some patients even when medical treatment is received. People with weakened immune systems are at the greatest risk for developing severe and disseminated histoplasmosis. Included in this high-risk group are persons with acquired immunodeficiency syndrome (AIDS) or cancer and persons receiving cancer chemotherapy; high-dose, long-term steroid therapy; or other immuno-suppressive drugs. H. capsulatum grows in soils throughout the world. 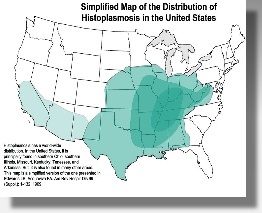 In the United States, the fungus is endemic and the proportion of people infected by H. capsulatum is higher in central and eastern states, especially along the Ohio and Mississippi River valleys. The fungus seems to grow best in soils having a high nitrogen content, especially those enriched with bird manure or bat droppings. The organism can be carried on the wings, feet, and beaks of birds and infect soil under roosting sites or manure accumulations inside or outside buildings. 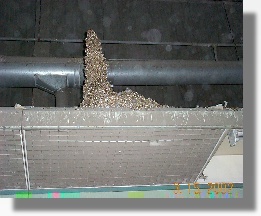 Habitats of pigeons and bats, and poultry houses with dirt floors have also been found contaminated by H. capsulatum.